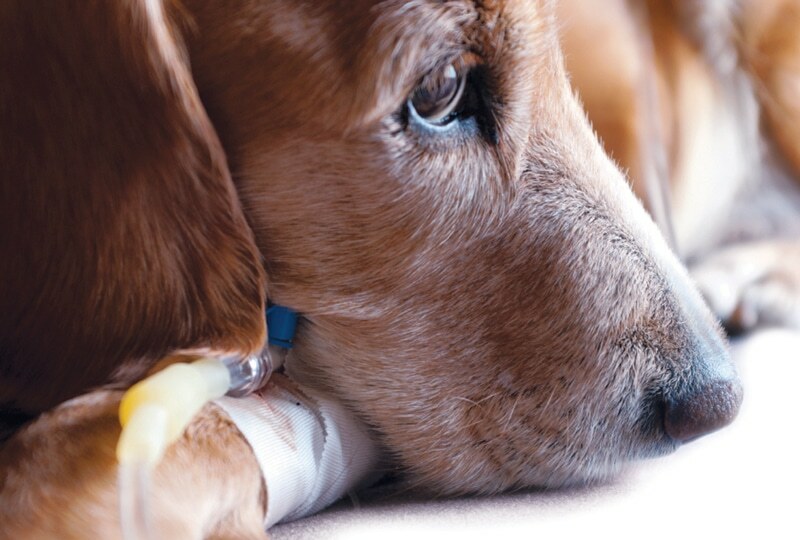 Options for fluid therapy in critically ill patients have become more varied as market growth has added several products in the veterinary field. The hetastarch formulations are more commonly used and provide fewer side effects than the dextran family. With the release of a new, veterinary-labeled synthetic hydroxyethyl starch product, VetStarch (6% hydroxyethyl starch 130/0.4 in 0.9% sodium chloride injection; abbottanimalhealth.com), this brief review of synthetic colloids and colloid therapy will help you and your practice team make the best decisions for patients. In a patient’s natural physiology, albumin functions as the primary colloid that makes up colloid osmotic pressure. Albumin is a protein with diverse functions that helps maintain colloid oncotic pressure (COP) and bind endogenous and exogenous substances, such as bilirubin, calcium, and some drugs. The molecular weight of albumin is 69 kDa, which is comparatively smaller than the synthetic colloids often used in veterinary medicine, which range from 130 kDa (tetrastarches) to 670 kDa (hetastarches). In contrast to the natural colloid albumin, synthetic colloid solutions are made of sugar polymers of varying sizes suspended in a crystalloid fluid carrier. The products have a wide molecular weight range, but are most typically reported as molecular weight averages. 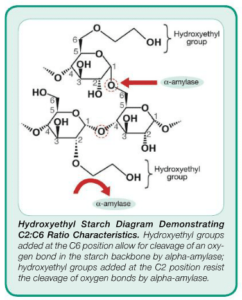 This article will focus on the hydroxyethyl starch (HES) sugar molecules. Colloid oncotic pressure (COP) can be measured by a colloid osmometry instrument to help guide use of colloids in practice. The device measures COP via injection of a blood sample into a chamber. After equilibration, the resulting pressure gradient is measured by a pressure transducer. The resultant COP can indicate whether goal directed therapy has been met for the patient. One commercial colloid osmometer is available (wescor.com/biomedical/osmometer/colloid.html), but the instrument is not often used other than in some referral practices and teaching hospitals. Molecular weight of the respective colloid formulation can greatly influence the half-life of the solution’s effects, as larger molecules are not freely filtered by the glomerulus in the renal tubule. Various biochemical properties of the starches render them more resistant to the action of alpha-amylase, a circulating enzyme that metabolizes sugar molecules. Since amylase metabolism reduces the half-life of the product, slowing the rate of hydrolysis is beneficial. The HES family has various subcategories, depending on the degree of substitution (of hydroxyl with hydroxyethyl groups) (Table 1). In addition to substitution degree, the organization of that substitution on various carbon positions, termed the C2:C6 ratio, affects the pharmacology of various solutions (Table 2). Continuous infusion during hypo-oncotic states. Crystalloid fluid doses of 60 to 90 mL/kg are administered in aliquots of 20 to 30 mL/kg for treatment of shock. The comparable dose for hetastarch solutions is 15 to 20 mL/kg, administered in aliquots of 2.5 to 5 mL/kg. A crystalloid dose of 20 mL/kg provides approximately the same amount of volume expansion as a hetastarch dose of 5 mL/kg, but the colloid’s effects are likely to be sustained longer than those of the crystalloid. During acute shock resuscitation, medium molecular weight colloids, such as the tetrastarches, may be more effective volume expanders than high molecular weight colloids due to their higher COP. These solutions also persist in the circulation for a prolonged period of time; however, they persist half as long as larger molecule hetastarch products. Patients with hypo-oncotic states, characterized by hypoalbuminemia or panhypoproteinemia, have an imbalance in intravascular and interstitial fluid movement and can be predisposed to interstitial and organ edema.3 Continuous infusions (CRIs) of HES colloids provide oncotic support until body proteins can be replaced. CRIs of synthetic colloids are typically calculated based on the daily recommended maximum dose divided out over a specific time interval, most often 24 hours. High molecular weight colloids are typically infused at 1 mL/kg/H. The medium molecular weight colloids have a shorter half-life but there are currently no data regarding recommended doses for use in hypo-oncotic dogs and cats in the intensive care unit setting. The maximum daily dosage recommendation for synthetic colloids is controversial at best. These doses are modeled from experimental studies in research animals and from human product labels due to the potential adverse risks seen at higher doses. Typically, hetastarch products are given at doses up to 20 mL/kg/day. In critical patients, however, the benefits of the product may outweigh the risks of higher doses. For instance, a dose up to 40 to 50 mL/kg/day of hetastarch may be needed to obtain the desired effects. Tetrastarch products are labeled for doses up to 50 mL/kg/day but, in my opinion, many patients do not require that high a dose. The initial dosing for a tetrastarch product is similar to that of a hetastarch, but the extended dose range is provided for patients that require higher doses or prolonged support on a CRI basis. There is less concern for adverse effects within that range due to the molecular characteristics of the product. Human labeled hetastarches have a duration of action of approximately 24 to 36 hours in humans; human labeled tetrastarches have a duration of action of approximately 12 hours in humans.4,5 There are limited data available regarding half lives in other species. Crystalloid fluids are predominantly based on a solution of sterile water with added electrolytes that approximates the mineral content of plasma. Colloid fluids are often suspended in crystalloid solutions containing water and electrolytes, but have the added component of a colloidal substance—large molecules (> 30 kDa) that do not freely diffuse across a semipermeable membrane. HES colloid solutions provide volume expanding effects using less volume (about one quarter) than crystalloid infusions. Intravascular expansion is achieved through altering hydrostatic and COP. Intravascular and interstitial volumes are maintained across the capillary membrane through a complex set of interactions termed Starling’s forces. Discussion of the forces is beyond the scope of this article. While crystalloids leave the vasculature rapidly (80% infused has left the intravascular space within 1 hour of administration1), colloid molecules are retained for a greater period of time, resulting in longer increases in blood pressure. 1. Mensack S. Colloids: Current recommendations. Vet Clin N Am Small Anim Pract 2008; 38(3):582-583. Colloids with a lower average molecular weight and substitution ratio but a high C2:C6 ratio have less, and potentially negligible, effects on the coagulation system.2 This higher C2:C6 ratio allows for protection of oxygen bonds in the hydroxyethyl starch backbone, slowing the alpha-amylase metabolism of the product. Colloid solutions are effective volume resuscitators during shock states. Because they capitalize on COP, significantly less volume can be administered while achieving excellent volume expanding effects. While all of these products cause some degree of coagulation system disruption, those with lower average molecular weights and substitution degrees have a wider safety profile. However, due to the shorter half-life of low molecular weight starches, higher doses appear to be required for maintenance CRIs in the intensive care unit when compared with high molecular weight starches. This article written in partnership with Dr. Daniel Edge of Abbott Animal Health. Muller L, Lefrant J. Metabolic effects of plasma expanders—Colloids: Advantages and disadvantages of the various plasma expanders. Transfusion Alter Transfusion Med 2010; 11(3):10-21. Mitra S, Khandelwal P (2009). Are all colloids the same? How to select the right colloid? Indian Journal of Anesthesia 2009; 53(5):592-607. Hughes D, Boag A. Fluid therapy with macromolecular plasma volume expanders. In DiBartola S (ed): Fluid, Electrolyte, and Acid-Base Disorders in Small Animal Practice, 4th ed. Philadelphia: Saunders Elsevier, 2011, pp 647-665. Hespan package insert. B. Braun Medical Inc., bbraunusa.com, 2012. Voluven package insert. Hospira, hospira.com, 2012. VetStarch package insert. Abbott Animal Health, abbottanimalhealth.com, 2011. Chan DL, Freeman LM, Rozanski EA, Rush JE. Colloid osmotic pressure of parenteral nutrition components and intravenous fluids. Vet Emerg Crit Care 2007; 11(4):269-273. Chan DL. Colloids: Current recommendations. Vet Clinics North Am Small Anim Pract 2008; 38(3):587-593. David Liss, BA, RVT, VTS (Emergency & Critical Care, Small Animal Internal Medicine), serves as the Program Director for the veterinary technology program at Platt College in Los Angeles, California. He has authored over 15 articles on emergency, critical care, and internal medicine topics and has presented nationally and internationally on fluid therapy. Mr. Liss’ areas of interest include fluid therapy in critically ill patients, nursing of the critically ill patient, and critical care syndromes, such as sepsis and systemic inflammatory response syndrome.